It’s been a little while since I updated the blog… and I’m planning on doing a better job. I even have a planned list of things to post on different days. So, I’m going to keep my fingers crossed and do the best I can! 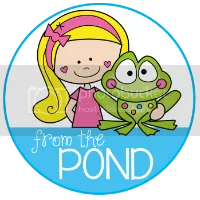 Since my last post, when I first opened a TeachersPayTeachers store, I have also started a TeachersNotebook store, which will (eventually) host the same freebies and activities for purchase. It’s a slow process, but I do love making resources and I’m hoping to have the opportunity to make some more in the near future. 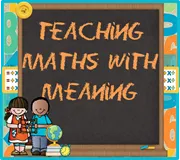 However, I do have 2 new activities listed in my TpT store – a literacy and a numeracy resource! 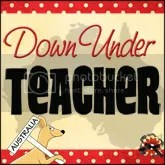 Purchase on TpT and Teachers Notebook (coming soon). This little resource is a number-match activity where students can match the numeral, number word and images to practise numbers 1-20. 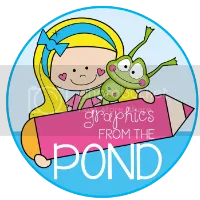 It has a very cute ghostly/halloween feel, thanks to Graphics from the Pond’s fab Little Friendly Ghost clipart. See a sample below! My second product for sale is Boo to You – an ‘oo’ sound game. Students make their way around the board by correctly reading ‘oo’ words and high frequency words. I’m joining the Manic Monday at Classroom Freebies link-up! Download a free sample of my Ghostly Number Match (with numbers 1-5) by clicking on the image above or by clicking here. I hope you enjoy it! Don’t forget to visit the link-up and check out other great freebies (and don’t forget to leave comments!). The term (and the year!) is slowly winding down. It’s the time of year when students and teachers alike start to notice the end is near… and act like it, too! One of the biggest challenges my students have had this year has been focusing on the task at hand. With a few very young students and a few who have great difficulty focusing for any amount of time, it makes my day very interesting (and has all year). This week, I threw my planned curriculum out the window. I was tired. The kids were tired. And there was no way we were getting through literacy and numeracy groups. So I tried a different tact. On Thursdays my students have 2 hours of Specialists, so it made it a great day to start this experiment. The first thing we did in the morning was start our experiment by exploring what the water crystals looked like before they got wet – this prompted a great discussion on adjectives. I’d made up an experiment notebook for them to use and record their observations. We completed the first 2 questions (what do the water crystals look like? and their prediction about what would happen when the water was added) before we added the water to each bucket. Then we left the buckets alone until just before recess when we checked the progress. 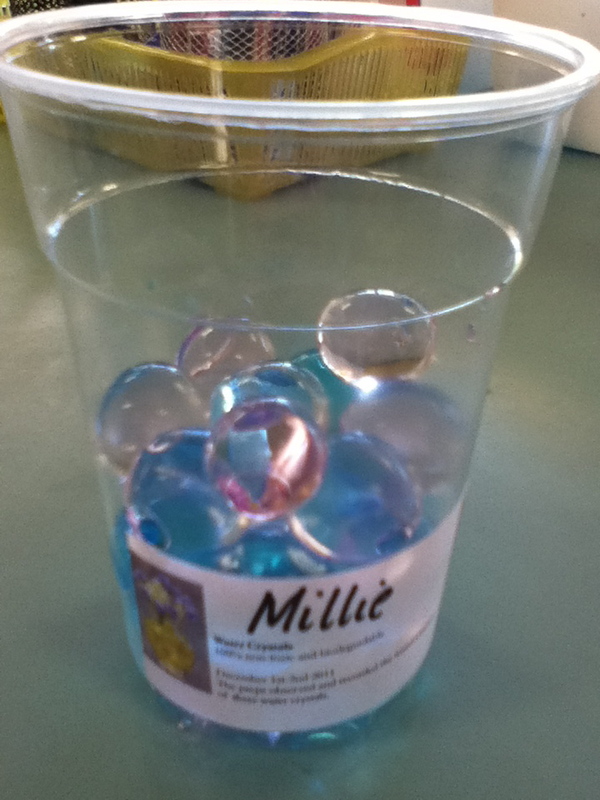 We noticed that they had changed shape – the water crystals now looked like small, soft, brain-shaped things. The water had changed colour, too. At 2:30pm we checked them again – and the shape was different again! All the students held the crystals and we had another discussion about adjectives to describe what they saw and felt and after a brainstorm on the board they wrote down their observations for after 4 hours. This morning when I arrived at school I rinsed the water crystals and left them out for students to see when they came in at 8:50am. Some of them had even brought their parents inside to see the water crystals! They had another feel and play and then I divided the fully-formed crystals into plastic cups for each student. A few hours later, we completed the final page in our workbook – what did the water crystals look like? and what did they feel like? Another great discussion on adjectives and writing simple sentences to describe their experiences. 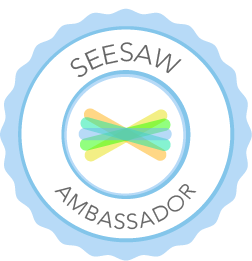 So, while I threw my curriculum out the window, this activity was definitely one of the most hands-on and engaging activities I’ve done all year. ALL my students completed the workbook at their own levels (my low and ESL students copied lists of words from the board, my higher-ability students extended their thinking – and one girl proved to herself that she was capable of writing great sentences in a shorter period of time than she was used to!) and illustrated them with a higher degree of accuracy than usual. I have to say, I’m happy with that outcome!